24th June, The Bristolian (Willesden-Newbury-Bristol-Swindon-Willesden): Lower Padworth; Wolfhall Junction. 30th June, The Great Western (Paddington-Swindon-Bath-Bristol and return): Uffington, Cholsey. 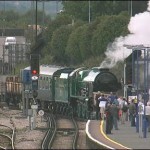 5th July, Brunel Bicentenary Special (Paddington-Swindon-Bath-Bristol): Milton, Baulking. 2nd Dec, The Christmas Great Western (Willesden-Swindon-Bath-(Bristol) and return): Moreton Cutting; Baulking. 6024 was unable to haul the return trip following a TPWS problem. 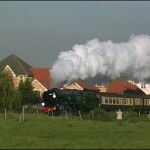 She was piloted by a diesel which ran too fast, causing a hot box on 6024’s tender. 9th Sep, Two Halls To Newport (Barnt Green-Hereford-Newport & return): Colwell Tunnel; Llanvihangel Crucorney (both directions); Lickey Incline. 24th Sep, The Shakespeare Express (Birmingham-Shirley-Stratford & return): Danzy Green; Wood End. This was the last run of The Shakespeare Express for the season, and the only time this year that it returned to Birmingham via Shirley. 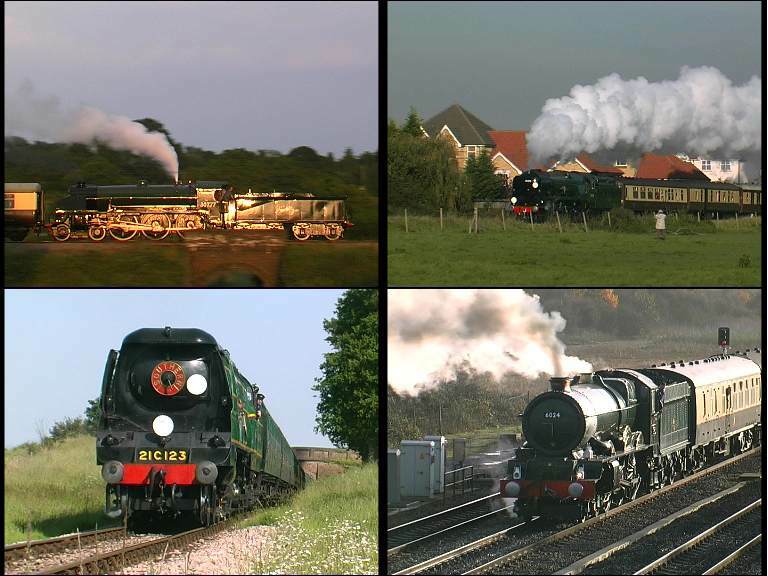 1st Oct, The Shakespeare Express (Solihull-Oxford-Didcot and return): Culham; Tackley. 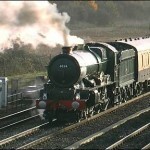 19th Nov, The London Lights Express (York-Doncaster-Peterborough-Kings Cross): Stoke Tunnel; Church End, Woodwalton. A short video is available on YouTube. 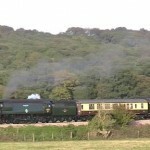 18th Mar, The Pines Express (Victoria-Newbury-Taunton-Bishops Lydeard): Somerton. 12th July, VSOE Special (Victoria-Salisbury-Westbury, Westbury-Reading-Slough-Victoria): Pewsey; Sonning Cutting. 34067 later failed at Acton with a recurrence of valve-gear problems. 23rd Sept, The Sussex Belle (Victoria-E Croydon-Hove-Bognor Regis, Littlehampton-Havant-Southampton-Andover-Victoria): Littlehampton; Lockerley; Grateley. 28th Oct, VSOE Special (Victoria-Salisbury-Westbury-Newbury-Victoria): Wylye. 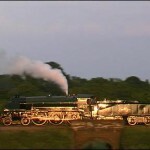 29th June, test run (Tysley-Shirley-Stratford-Dorridge-Tysley): Wythall; Bearley Junction. 6th Aug, The Dalesman (York-Leeds-Settle-Carlisle and return): Selside; Mallerstang; Ais Gill. 27th Aug, The Dalesman (York-Leeds-Settle-Carlisle and return): Horton in Ribblesdale; Langwathby; Wharton Dikes. 28th Aug, The Hadrian (York-Darlington-Newcastle-Carlisle and return): Bardon Mill; Skellion, nr Brampton; Durham. 29th-31st Aug, The Scarborough Spa Express (York-Scarborough-York): York; High Scampston; Scarborough; Knapton Mills; Kirkham. 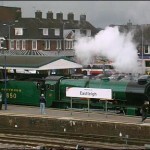 16th Aug (Eastleigh-Salisbury-Taunton-Minehead): 850 left Eastleigh works for running-in on the WSR. 6th Nov, test run (Stewarts Lane-Staines-Fleet-Eastleigh-Wimbledon-Stewarts Lane): Egham, Battledown, Steventon, Basingstoke. 21st Dec, VSOE Special (Victoria-Guildford-Redhill-Victoria): Albury Heath. Click here to see a video sequence, hosted on YouTube. Aditional material from Adrian & Jackie Pallant.